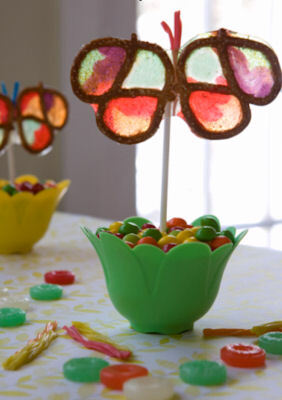 With spring trying desperately to make itself known, I thought it would be nice to try another of Beth Kimmerle’s crafty candy creations (say that ten times fast!). 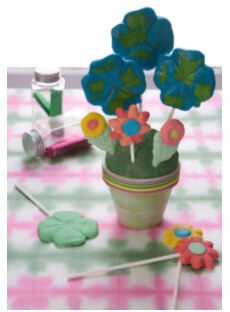 Today I bring you gum pops, fun treats that are easy to make, fun for kids (and adults! ), and great for the season. The last time I headed into Dylan’s Candy Bar it was for a fairly hideous Swedish Fish event. So, it was with some trepidation that I ventured back for a media get-together with Beth Kimmerle, author of Chocolate: The Sweet History and Candy: The Sweet History (among others). Thankfully, I was pleasantly surprised by how enjoyable the afternoon turned out. The event basically showcased Beth’s crafty creations using candy. Some of the things were absolutely amazing (I especially liked the pretzel butterflies – see above), and all were great ways to find creative uses for candy as well as being fun to do with the kids. Beth is a big fan of Life Savers Gummies (who isn’t?) and a lot of her creations seem to utilize the tasty treats. One big thing I found out is that the packaging is changing for Life Savers Gummies – instead of that tubular thing that never seemed to hold quite enough, they’re now coming in small bags. They’ll still fit in your purse, but you get more. Woot!